Agaricus is a blend of extracted agaric mushroom and our specially processed Rokkaku-Reishi(六角霊芝)* patent pending. 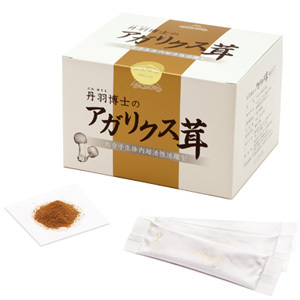 Rokkaku-Reishi is a kind of Reishi mushroom (Ganoderma lucidum) richly containing beta-glucan and well documented for its ability to modulate the immune system. All our products are made from carefully sourced and selected natural ingredients. We source our agaricus from China - the world’s number one mushroom cultivating country - from May to August. This wonderful product contains many life enriching nutrients such as beta-glucan, vitamins, minerals, nucleic acid, amino acid and enzymes. Protein, glucide, carbohydrate, sodium, ash, moisture, beta-glucan.